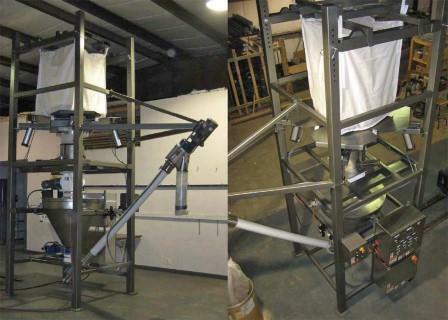 Sterling offers a full line of bulk bag unloading and weighing systems. Sterling offers a full line of bulk bag unloading and weighing systems that incorporate many of the same designs as the modular weighing system but support the use of bulk bags and totes. Customized solutions are provided for filling the supply bins such as drum or tote tippers, mechanical or pneumatic conveying. Sterling offers many scaling solutions including gain-in-weight & loss-in-weight (continuous or batch). Once the raw materials are weighed, a variety of turnkey solutions for conveying/transporting the batch are available. These carefully selected solutions are used to convey/transport the product to the use points such as a day bin or mixer. Typical conveying systems include pneumatic and mechanical conveyors. Totes are commonly used where cross contamination or product degradation is a concern; both solid surface totes and flexible totes are used.